NEW YORK – About 200 people turned out to an outdoor rally on Sunday sponsored by Democratic mayoral candidate Bill Thompson, to protest current Mayor Michael Bloomberg’s handling of the city school system. The issue of public education has been a major point in the election. Bloomberg has spent millions of dollars to paint a picture of himself as a mayor who’s essentially saved the city school system. Another fact the PAC put forward: no bid contracts under the Bloomberg administration have increased by a whopping 50,000 percent since 2001. In his position as city Comptroller, Thompson has uncovered millions of dollars of waste and corruption within the city’s Department of Education, a great deal of which was in the form of no-bid contracts. “Latino and African American kids are being left behind,” Dr Luis Reyes, who worked in the schools, told the crowd. Thompson, he said, wouldn’t allow this to continue. If no one was in charge, Thompson argues, and the system itself was to blame, it is deceitful and self-serving for the mayor to criticize Thompson. 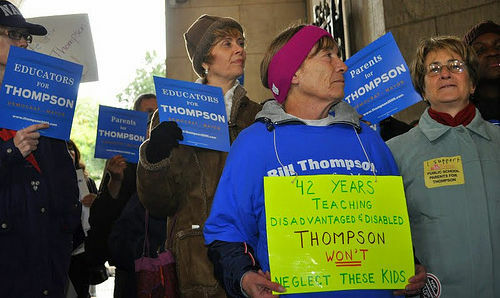 Many have come forward to defend Thompson’s record at the now-defunct Board of Education. They argue that the then-president, given the position he was in, did an excellent job fighting to reform the system and restore accountability. But Thompson also calls for changes in the way the Department of Education is run. The changes would allow for more input by the city council, which is closer to city residents, as well as from parents and teachers. 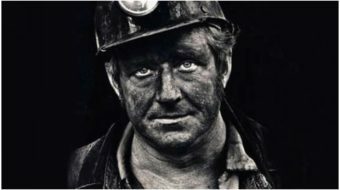 Bill Davis also contributed to this article.